Description: Shell discoidal and involute with intermediate expansion rate. Compression of the whorl section increases with diameter. The wide umbilicus (0·20-0·25) is surrounded by steep umbilical walls that pass into the flanks in a wide arch. The flanks are slightly convex with the maximum whorl breadth above the middle flank. Flanks converge ventrally and pass into the broadly rounded venter in a wide bow. The dorsal flanks present six bullae per half whorl. Six to eight parallel, slightly prorsiradiate and concave lirae are present between two bullae, but they are not visible in the dorsal area. On the middle flank lirae are straight but become convex towards the venter where they cross rectiradially. Suturallobes are deep and fine incisions with phylloid saddle terminations and a shallow ventral lobe. The suturallobe is retracted. Remarks: The most conspicuous features of the specimens described here are the wide umbilicus and the dorsolateral bullae. Species of Hypophylloceras (Neophylloceras) with a similarly wide umbilicus are H. (N) surya (Forbes, 1846), H. (N) marshalli (Shimizu, 1935), and H. (N) cottreaui (Collignon, 1956). In Text-figure 4 the whorl diameter is plotted against the umbilical diameter to evaluate a possible relationship of the Cerralvo specimens with one of the above species. Hypophylloceras (Neophylloceras) surya (Forbes, 1846) shows eight or more bullae per half whorl in more adult stages as compared to six per whorl reported here for the Cerralvo specimens (e.g. Henderson and McNamara 1985; Kennedy and Henderson 1992b). The specimens described here may be juveniles of this species as suggested by the UID relationship (Text-fig. 4). However, in that case an increase in the number of umbilical bullae should exist during ontogeny, a change that has not been described so far. Hypophylloceras (Neophylloceras) cottreaui (Collignon, 1956) was described from a single specimen which is much larger than our juveniles. lt differs from other Neophylloceras in having a very wide umbilicus (UID = 0·17). In addition, it is more inflated and characterized by six strong bullae per half whorl arranged close to the umbilicus. The bullae were described by Collignon (1956, p. 25) as 'flat costae with quadratic cross section that are separated from each other by a deep groove.' This feature cannot be evaluated properly in the specimens described here. In addition, umbilical tubercles are described by Collignon (1956) which are absent in the present specimens. Hypophylloceras (Neophylloceras) marshalli (Shimizu, 1935; Henderson 1970) is another species with a wide umbilicus and ornament of 'fine, closely spaced ribs which are slightly prorsiradiate on the dorsal flanks, straighten at the mid-flank and are rectiradiate across the venter; the dorsal flanks bear six folds in a half whorl' (Henderson 1970, p.3). The U/D relationship reported coincides with our material (Textfig. 4), but the sigmoidal bending of the dorsolateral ribs and their density differ from our specimens. 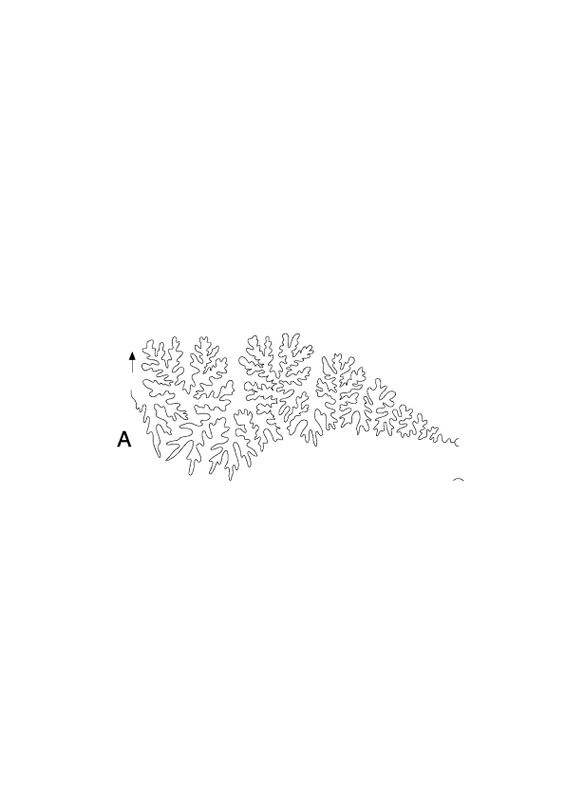 On the other hand the specimen described by Henderson (1970) is larger (D is 42·0mm). Another species with similar ornament is H. (N) infiatum (Stinnesbeck, 1986), but this species differs considerably from the Cerralvo specimens in test size ratios and in having a whorl section that is much more inflated (Text-fig. 4). In addition, the ontogenesis of H. (N) infiatum clearly follows a different path in the U/D relationship. Shell measurements (Text-fig. 4) suggest that the Cerralvo specimens may be juveniles of H. (N) surya, although they are too small to allow precise determination. 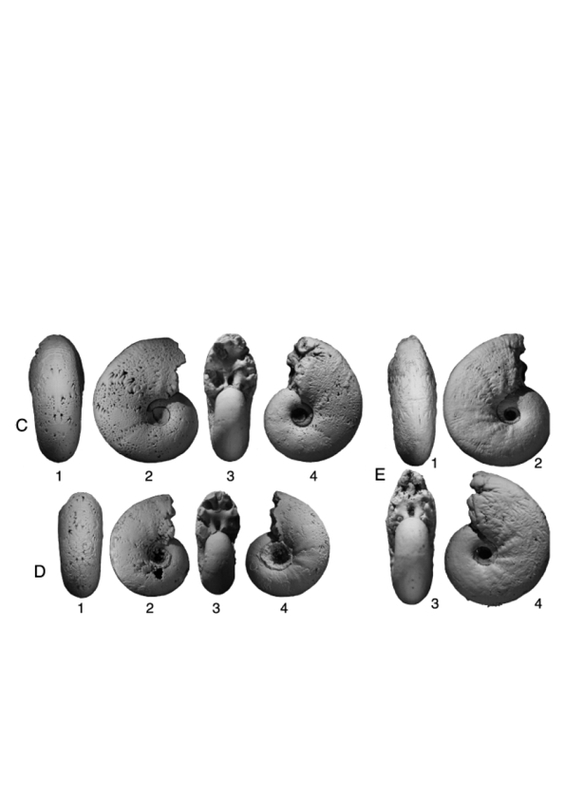 Occurrence: Hypophylloceras (Neophylloceras) surya (Forbes) has been recorded from the Maastrichtian of southern India (Kennedy and Henderson 1992b), Madagascar (Collignon 1956), South Africa (Kennedy and Klinger 1976), western Australia (Henderson and McNamara 1985), the Biscay region, Alaska, California, Japan (Ward and Kennedy 1993) and Denmark (Birkelund 1993), and the Upper Maastrichtian of Pakistan (Fatmi and Kennedy 1999) and Chile (Stinnesbeck 1986).